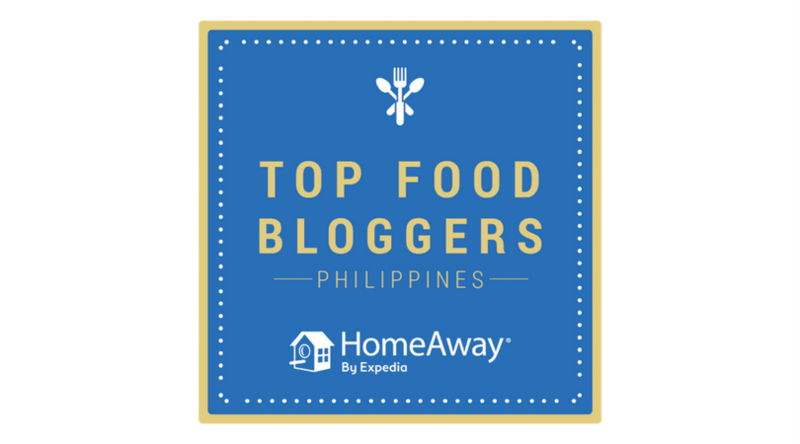 Laguna has seen an amazing growth in its culinary tourism in the past few years. When Nuvali was developed, Sta. 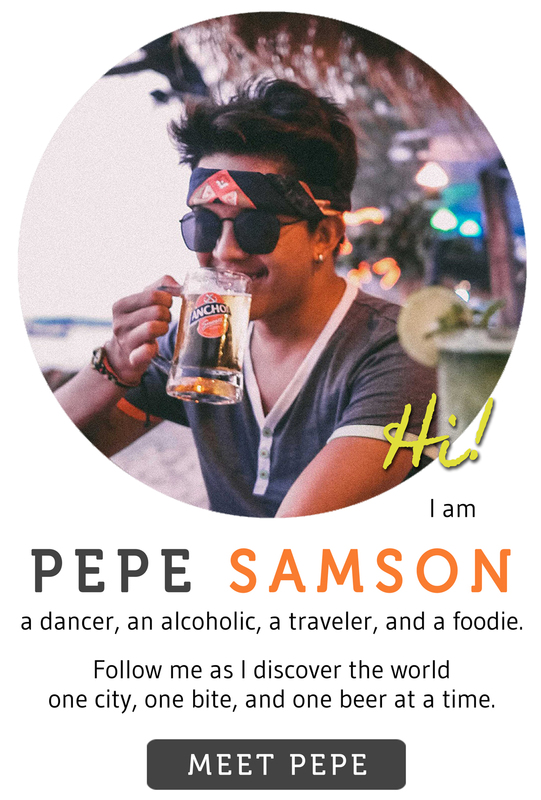 Rosa was transformed into a major food hub; from popular fast food chains to homegrown concepts, this commercial district offers a wide selection of dining choices to weekenders and foodies looking for new, unique experiences outside Manila. 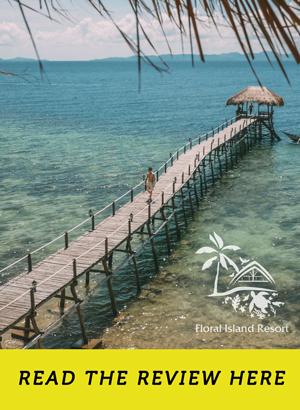 Greenfield City, a humbler destination, houses residential buildings, specialty shops and restaurants that are worthy of a planned visit as well. Socrates Secret, a Mediterranean-inspired restaurant in Greenfield, was one of the first occupants of this mall, and also one of the best dining venues in the south. I first visited Socrates’ Secret a year ago, back when we were going back and forth regularly to Laguna for an event we were organizing there. 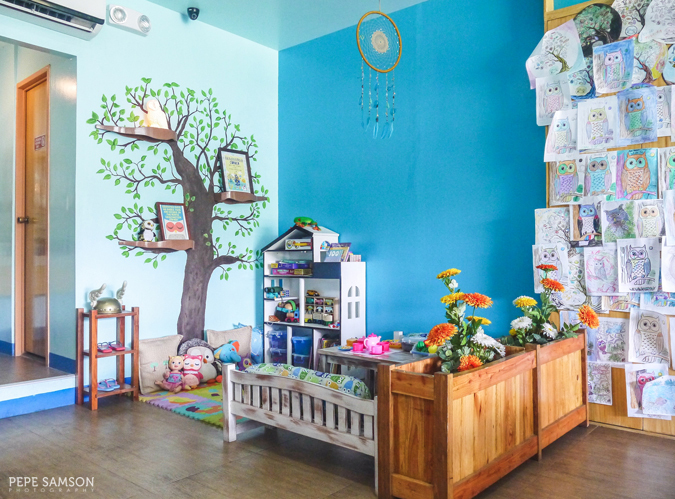 At the time, Laguna Central in Greenfield City was barely developed—only a few shops have opened; some parts had floors that were still unpainted; and only a few people come to the area to eat. 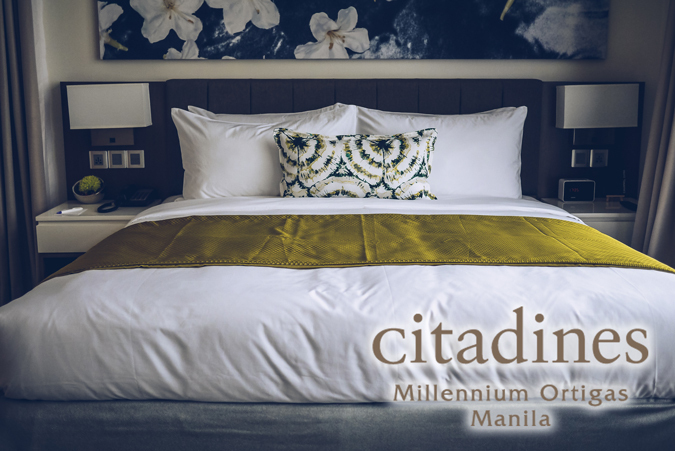 Today, the mall boasts of more restaurants, service centers, and retail stores that cater to the needs of people living within the vicinity, as well as to tourists seeking for something they can’t find in the metro. 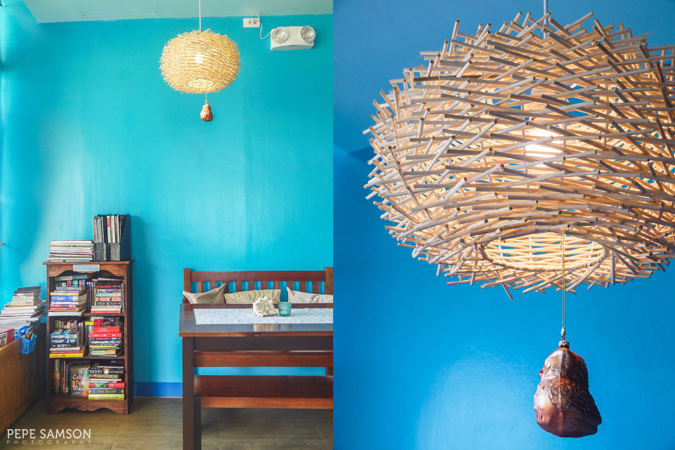 We visited during dinner then—and I could still remember how astounded I was with the appealing interiors. Never did I think it would be ten times prettier during daytime! 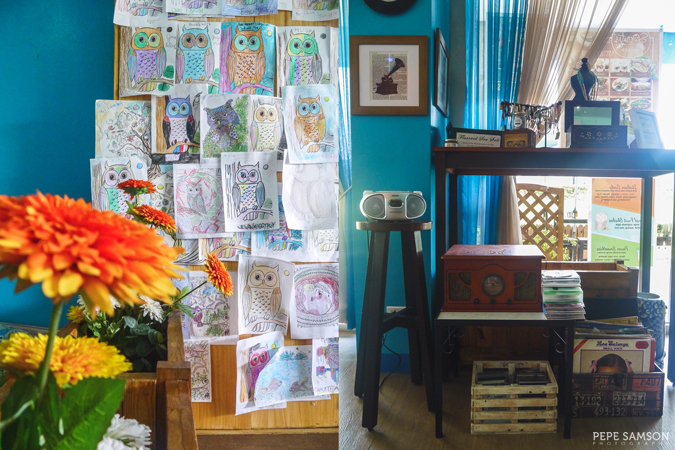 The walls radiate with a deeper shade of blue; the floor-to-ceiling windows fill the space with beautiful natural light; and the colors of each carefully-thought-of trinket pop out more. 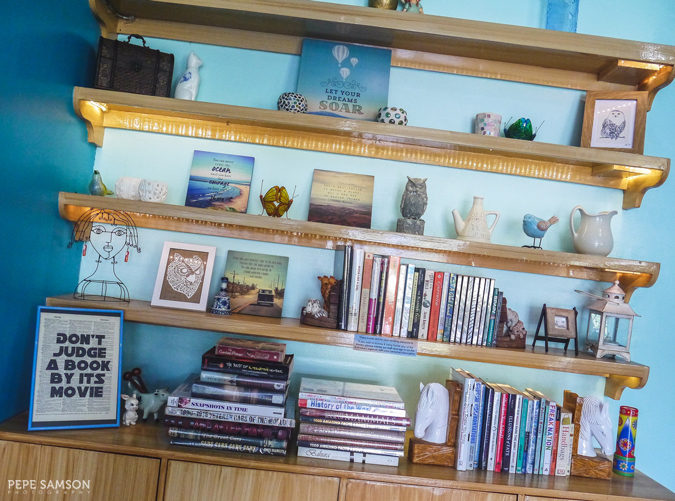 The signature centerpieces—lamps, shells, candles—are still there, as well as the bookcase showcasing the owner’s collection, and the art area where the customers’ creations are displayed. The food is still as delicious as I remembered—maybe even more. 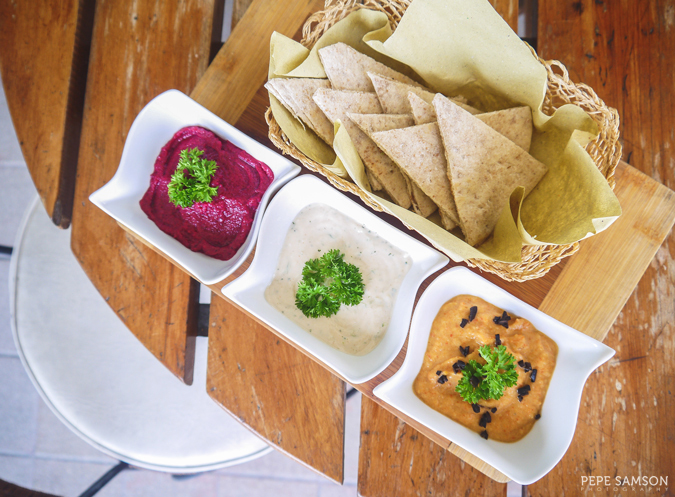 We tried Socrates’ Secret’s new dip sampler (PhP380/3 variants) consisting of Italian Roasted Vegetable, Egyptian Red Beet, and Tzatziki dips, served with a pita bread basket. I loved the Italian dip (PhP150 solo) made of eggplant, tomato, bell pepper, and garlic, blended and lightly roasted so that it gives a slightly spicy flavor. The Egyptian dip (PhP180 solo) has pureed roasted beets with a bunch of other spices—a combination of zing, smokiness, and subtle sweetness; this was my favorite among the three. 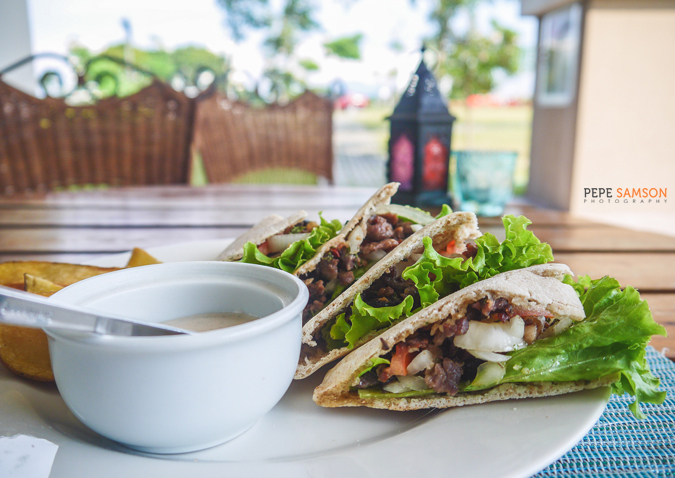 The Tzatziki (PhP150 solo) is a staple Greek sauce of cucumbers, olive oil, and yogurt. 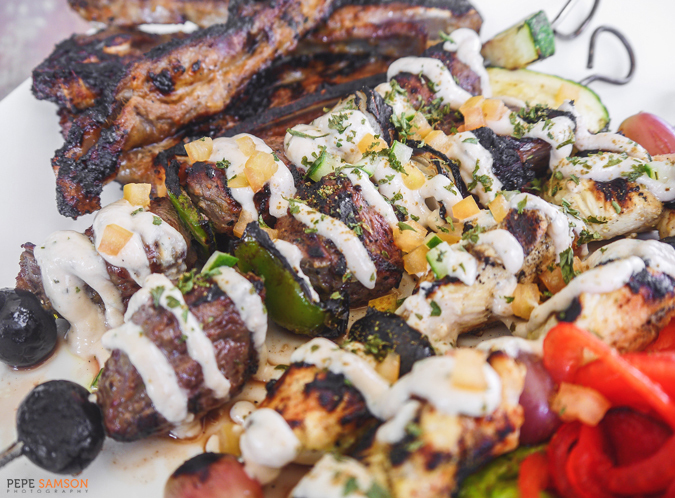 This is usually served with any Mediterranean appetizer such as falafel and potato cakes. 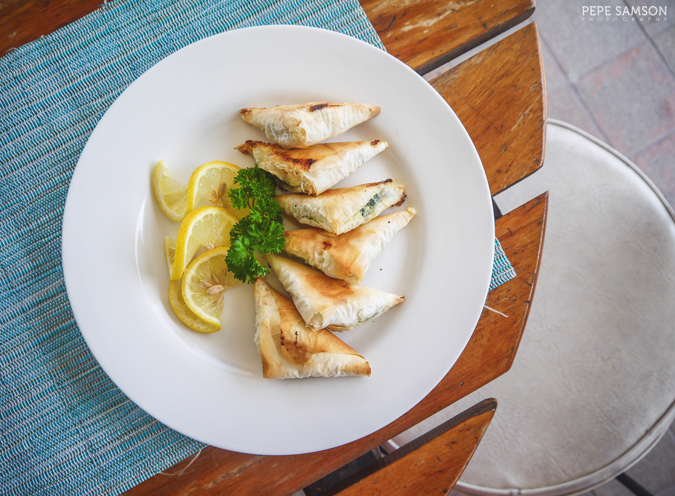 The Spinach and Feta Triangles (PhP235/4pcs, PhP315/6 pcs) was an easy table favorite. 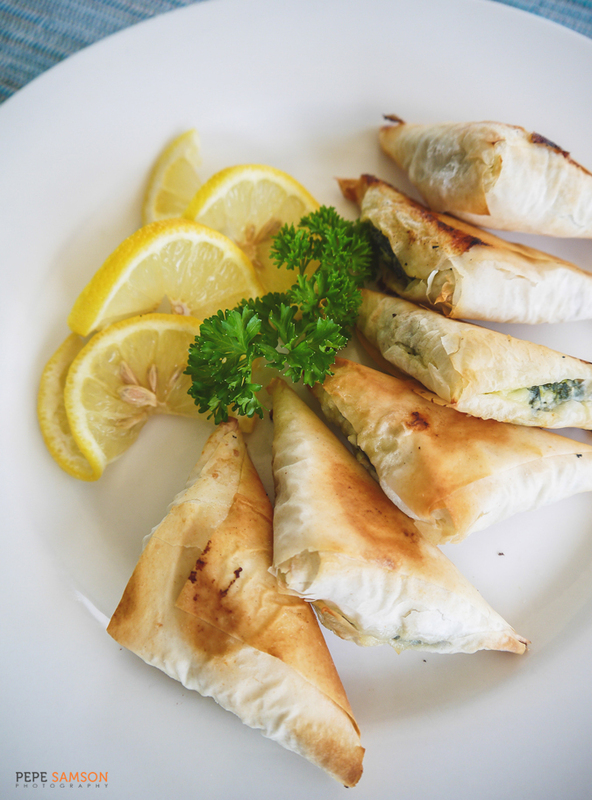 Similar to the Turkish Borek, these pastries made of layered phyllo ensconced a creamy filling of spinach and feta cheese inside—a light and flaky starter that vegans and non-vegans alike would go crazy for. It’s amazing how the phyllo dough was made paper thin and very delicate, unlike thicker versions you would normally see with baklavas. Two thumbs up! 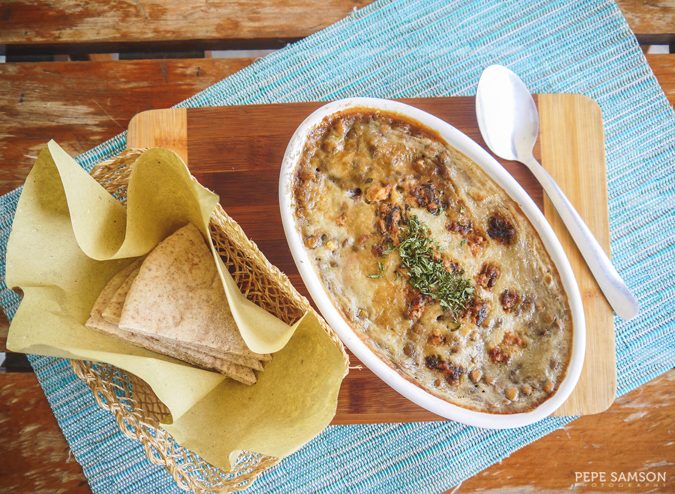 Another new dish is the Vegan Moussaka (PhP295)—a proof that healthy food can be incredibly delicious when done right. You can tell that the owner and the chef put a lot of thought and love to this dish—from the soy and tofu based béchamel sauce and cheese, to the layers of delicious eggplant, squash, and lentils concealed underneath. It’s even more exquisite than the meaty version I tried before! 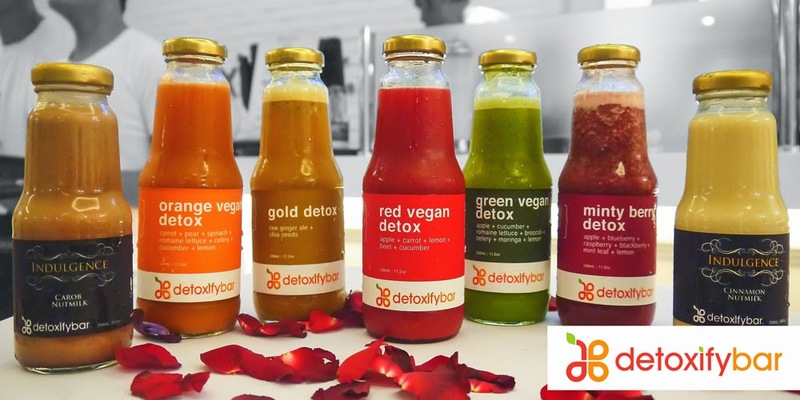 Since we’re on the “healthy” subject, allow me to say that if being healthy means eating the next dish every day, thrice a day, then I would gladly become a convert. 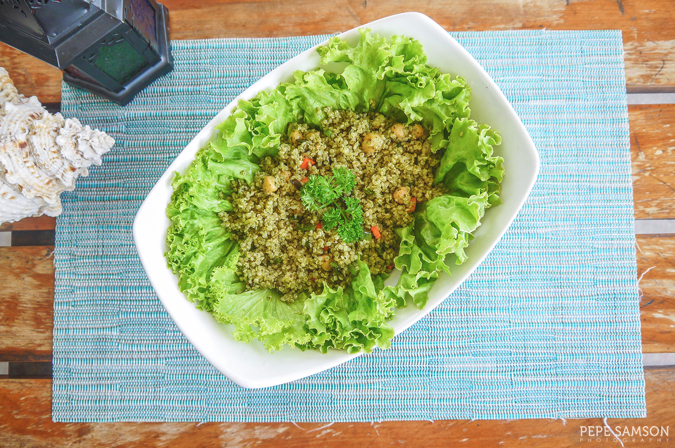 Socrates’ Secret’s Quinoa Salad Green Pesto (PhP410) is freaking delicious. When my fitness-obsessed sister started bringing home bags of quinoa months back, I teased her mercilessly and told her I refuse to eat bird food. I take it all back. Quinoa is soooo delicious. Especially if cooked like this—with a light pesto sauce and topped with roasted vegetables. If you’re a fan of gyros, the restaurant serves some hefty ones with your choice of meat (beef, chicken, lamb). I had tried the first two before, so we had the Lamb Gyro (PhP285) this time. 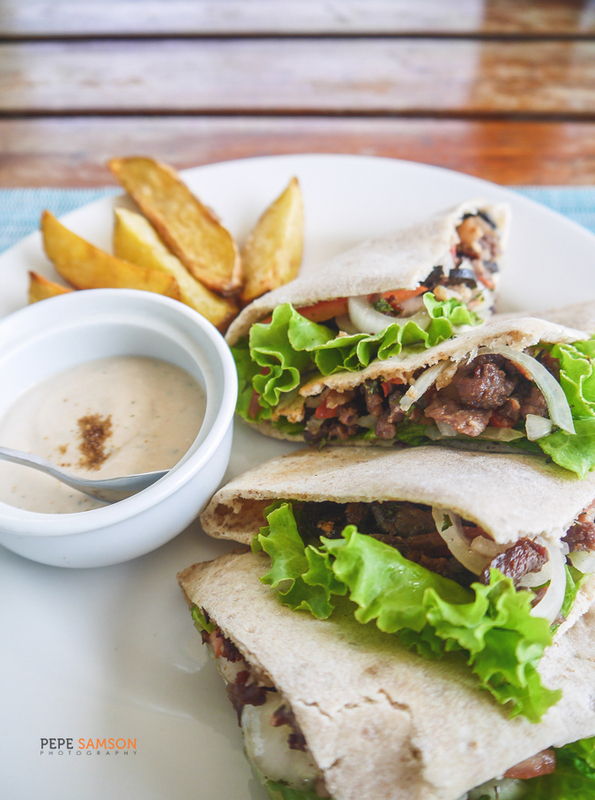 Made of whole-wheat pita, onions, tomatoes, black olives, lettuce, and lamb, these sandwiches are filling and tasty—perfect if you’re looking for a heavy meal that won’t break your diet. I remember how mild the gyros tasted before—they have improved a lot! 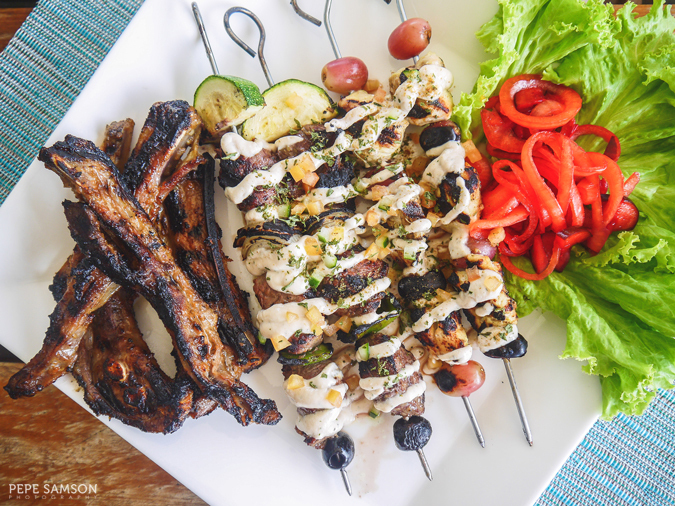 For mains, we had the Mediterranean Mixed Grill consisting of beef and chicken souvlaki and Honey Mustard Lamb Ribs (PhP590/full). The souvlakis were just as tasty as I remembered them, only this time they were accompanied with these delicious pickled onions that became an addiction! 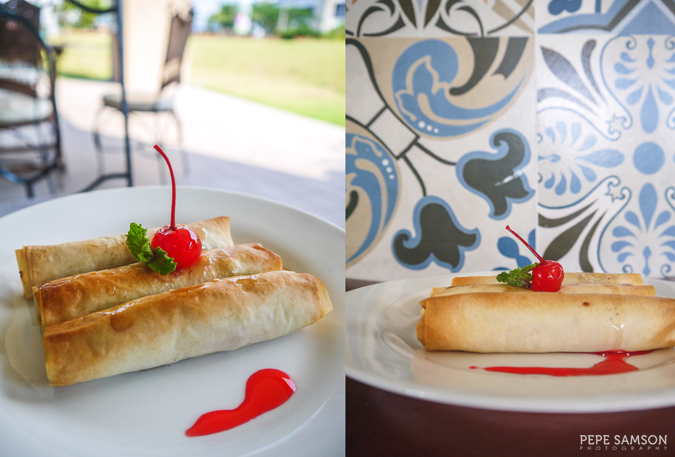 For dessert, we had these beautiful golden rolls that turned out to be baklavas (PhP190/3 pcs). 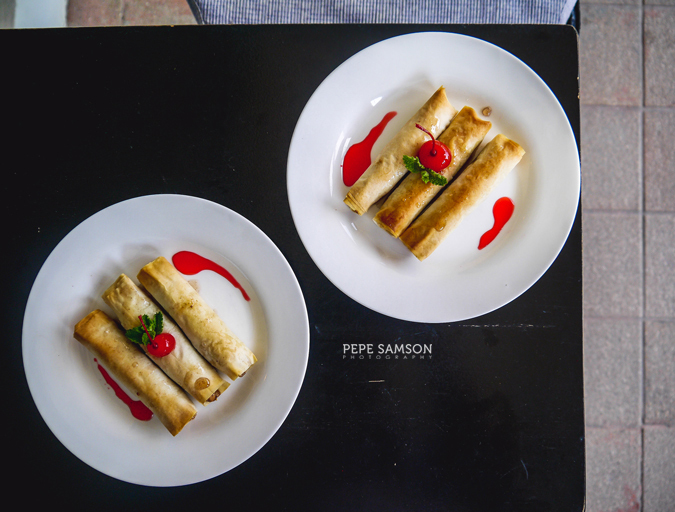 Offering a unique take on this Lebanese sweet, the phyllo is rolled like a cigar, enveloping a delicious mixed-nut filling, before being drizzled with some caramel and topped with cherries. It’s the kind of dessert that satisfies your sweet tooth without putting you into a food coma. Slow clap for this one! Wash away all that food with Socrates’ Secret’s refreshing drink selections, but it’s not as if you would need to solely for that reason. 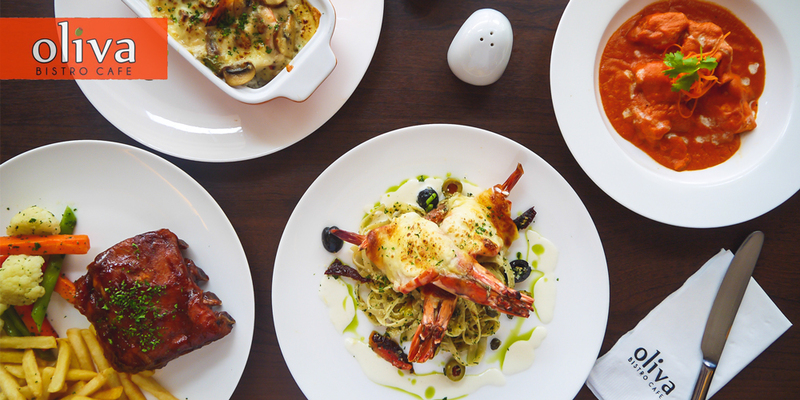 The dishes’ flavors are balanced and not overwhelming, and the drinks are not designed only to complement, but to be appreciated even on their own. 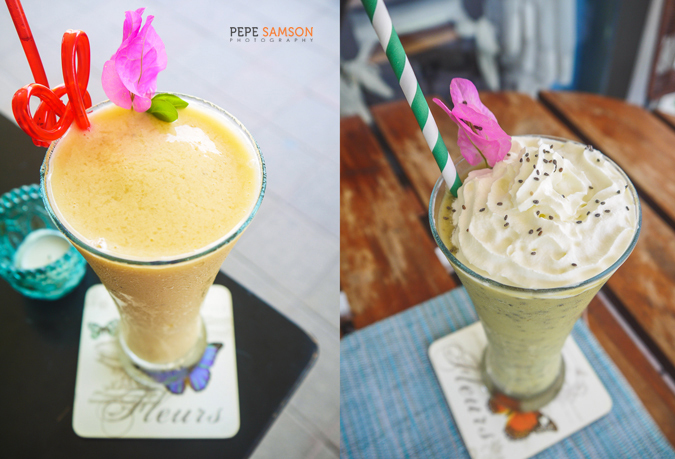 My absolute favorites were the Banana Mango Ginger Kefir (great for digestion) and Avocado Honey Chia Smoothie (avocado!!). 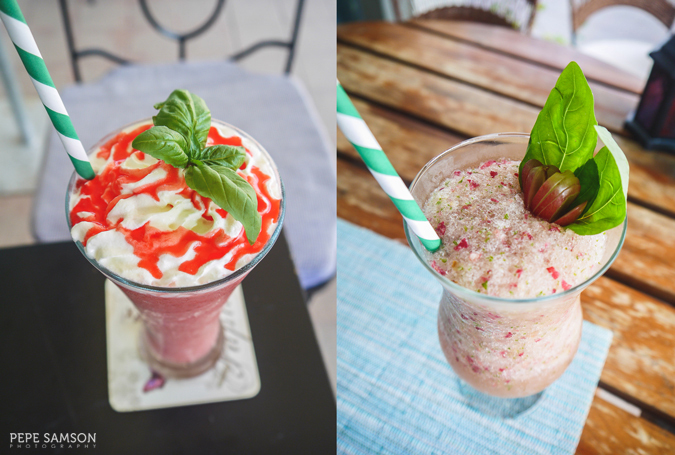 The refreshing Red Grape, Apple and Mint Shake, Strawberry Slush Yogurt, and Matcha Coconut and Black Sesame Smoothie (a very interesting combination that works) are also good choices. 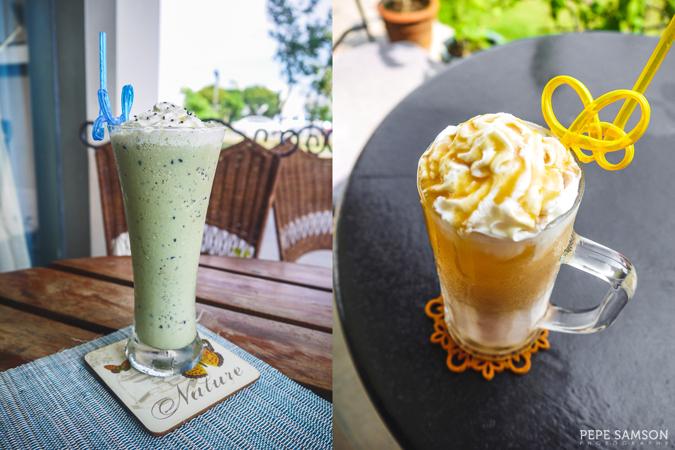 They also serve Butterbeer in both alcoholic and non-alcoholic versions! Socrates' Secret, although catering more to the healthy folks, is also an advocate of locally-made craft beers. 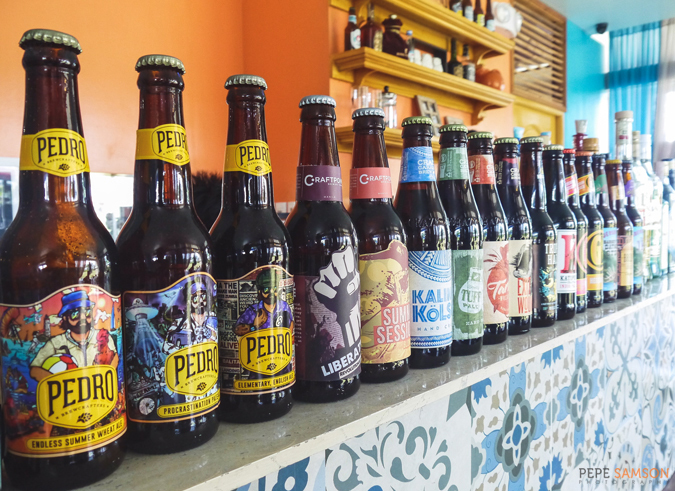 Among its selection are brews from Pedro, Craftpoint, Crazy Carabao, Katipunan, and Nipa Brew. Hopheads would definitely enjoy a bottle or two of these beers over lunch or dinner. As with my first time, dining at Socrates’ Secret was such a pleasant experience. The dishes are well-thought-of, each one made flavorful while still taking into account the healthy diner’s lifestyle choices. 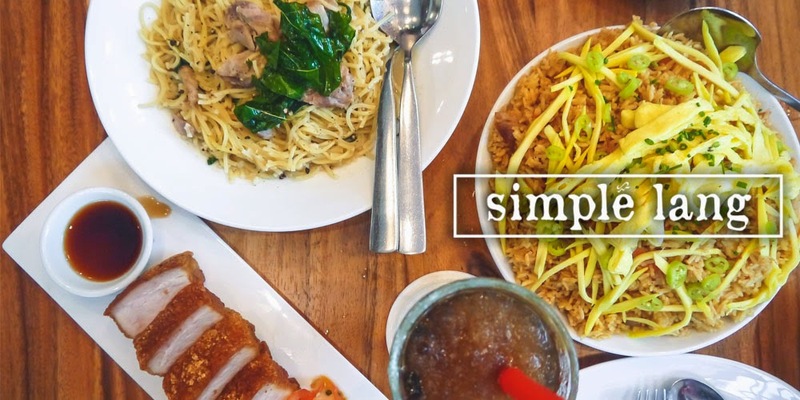 The great thing about this restaurant is that they allow guests the freedom to customize his dishes as he wishes—whether he wants a “regular” version or one that is 100% vegan or gluten-free. All he needs is to ask the chef. 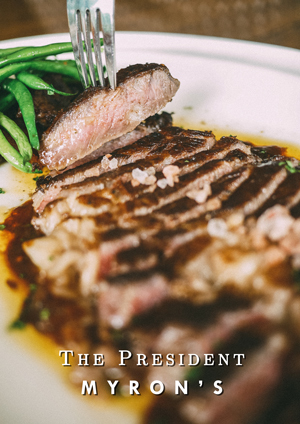 No wonder the restaurant bagged a 2016 Certificate of Excellence from Trip Advisor for superior service! 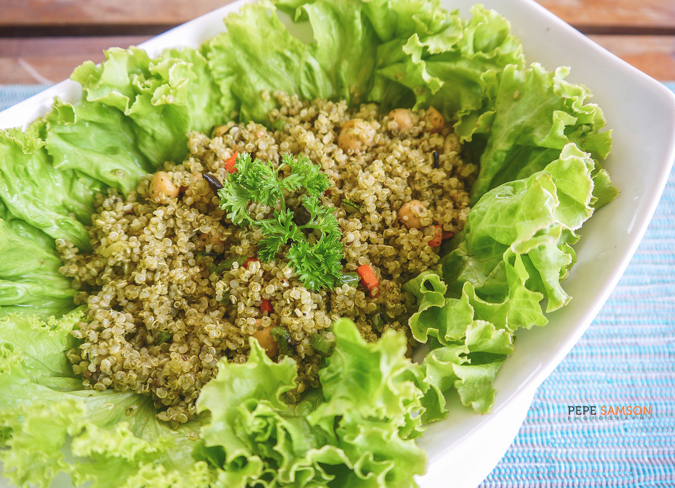 The next time you’re taking a trip to the south, drop by Socrates’ Secret and enjoy a lazy lunch of healthy and delicious food that will surely take you to the streets of Middle East. 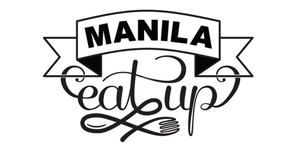 What restaurants do you love in Laguna? Have you tried Socrates' Secret? My meal was sponsored by Socrates' Secret Restaurant. All opinions, however, are my own.